2016 has been a year full of breaches and a year full of passwords I’ve had to change. One resolution I’ve made in 2017 is to get away from using any multi-account passwords combinations, which means I’ve got to go full tilt into a password manager. I’ve been using KeePass for almost two years now with great success, but one of the main weaknesses in my method is the use of a rather weak master password. The password is rather long and complex, but it would be easy enough to break if you knew me. The solution for me was to print up a password card from PasswordCard (warning - the cert throws an invalid certificate warning due to a SHA-1 signature). 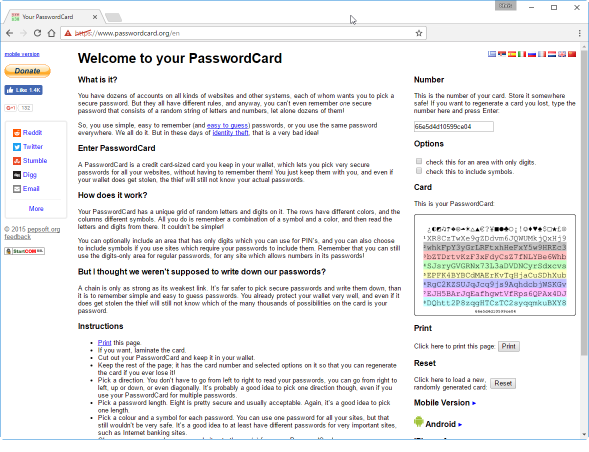 PasswordCard is a free website that allows you to print up a card containing a completely random list of characters that can be used to create a secure master password. How does the process work? Head over to the website and tick off the box for “check this to include symbols.” Print off at least two copies of the card (one for your wallet, one for safe keeping), and put the number in your password list. Without this number, you won’t be able to regenerate the card should you lose both of them. I’d recommend laminating the card at the very least, but you could etch it on metal as well. To use the card, pick a string of characters from the card in some fashion that will be easy for you to remember. Use this to setup your password safe password (or any password if you want). The password should meet the minimum recommended criteria for a safe password, but considering this is your “master” password I would recommend at least 12 characters. Viola - a secure password using something you know and something you have. It’s not true two-factor authentication, but it can work well for most people.